If you’d like to play, here’s TNChick’s link! Very beautiful! So so love the shot! Your photographs are absolutely gorgeous. This is amazing. Excellent! The focus is so crisp, and the framing makes for great balance. Beautiful critter, beautifully shot. Gorgeous! You got the lighting perfectly – really capturing his (hers? its?) irridescence. Whoa. That is gorgeous! I’m so impressed when people can get such elusive shots like that. Nice! Gosh, I saw a guy just like this. I was convinced he was a fairy. He hung around and seemed to watch me. This is an amazing photo. This is an amazing shot, I love her beautiful wings….so intricate! Dragonflies make me think of fairies! An amazing shot, and has such softness to it! what an awesome BEAUTIFUL capture! wow – that shot is stunning. OMG, that is absolutely gorgeous! He looks like a mini helicopter ready to take flight. wow. that’s a super nice shot. thanks for stopping by my fill in. and i’ll check weight watcher later. Greatly ~ Beautiful!! 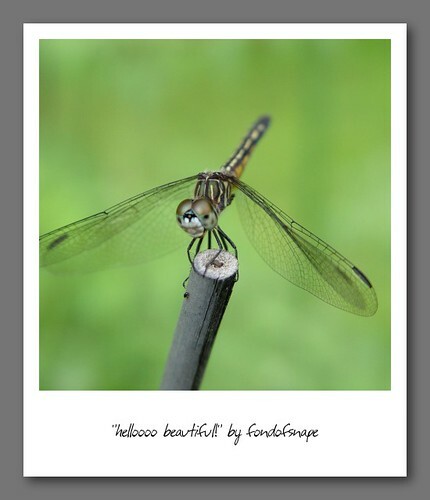 I love dragonflies…I hardly ever see them, but when I do I stop and follow their little zig-zagging trail. I don’t know how you got this amazing shot- but wow! It’s stunning!! A gorgeous site for sore eyes. Holy Smokes! Did you take that shot? Holy crap but that’s an amazing photo!! So really…how long DID you have to wait to get.the.perfect.shot? Gotta love this! Such a super capture and line to go with it.